The first set of 2012 has been launched with the comics of Nagraj comics Order of Babel being the main comics in this set. 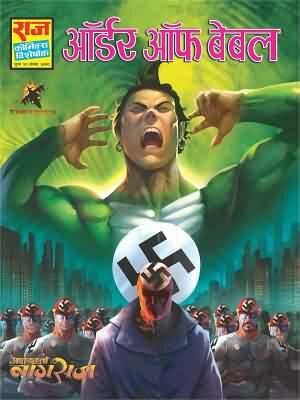 This is the comics from Aatankharta Nagraj where he is on a mission to fight crime across the world. Nagraj goes from country to country fighting terrorism and various evil creatures. Order of Babel is a terrorist group in the comics, who has shown a horrifying video to Nagraj and challenged him. Nagraj has accepted the challenge and is after these killers. Now Nagraj is in Germany to fight these criminals, where everyone is saying Nagraj should leave Germany. Will Nagraj be able to fight and deafeat the criminals well Nagraj sure has insurance and he will never move back from his actions read the comics to know more Order of Babel is available on Raj comics store link is given below.